NASHVILLE, Tenn. (AP) — Wesley Woodyard misses putting milk in his cereal, and try as he might, the Tennessee Titans linebacker still reaches for a strip of bacon here and there. Giving up meat hasn’t been easy, but in a league where everyone is looking for an edge, Woodyard and the Titans think they’ve found one in the produce aisle. Woodyard and at least 10 teammates — mostly on defense — have opted to eat vegan diets this season. Football players have long had a carnivorous reputation, but Tennessee’s defenders say they feel energized by their nutrition adjustment, something that’s helped the unit rank third against the run and fifth in the league with 40 sacks. Woodyard is in his 10th NFL season, and usually by this time of year, he’s taking daily naps to combat late-season fatigue. Not so much since going to a plant-based diet. Linebacker Derrick Morgan sparked the move away from meat. He and his wife — Cordon Bleu-trained chef Charity Morgan — had gone vegan for stretches, and when Morgan’s nutritionist advised him 10 months ago that veganism could help maximize his athleticism, he decided to give up meat and dairy entirely. Having a trained chef in the house eased the transition. Charity Morgan studied plant-based meals online and began preparing dishes for her husband. By the time training camp opened, Charity Morgan was also feeding defensive lineman Jurrell Casey, a three-time Pro Bowl selection, and defensive end DaQuan Jones. Her client list grew as more teammates smelled what she had cooking. Charity Morgan is now feeding 11 Titans — and sometimes a few wives — with more on a waiting list. She’s also dished advice to other wives about handling vegan dinners at home. Favorites have included vegan crabcakes and pea protein burgers with Charity Morgan’s own take on In-n-Out’s special sauce. The chef delivers a pair of coolers packed with food each day for practice, and she even provides breakfast burritos on game days at home. The Titans are 8-6 and the defense ranks 13th overall in the league. With results on the field holding strong, there hasn’t been any concern about the diet from coaches or team officials. Some players have found they can’t quite do vegan full-time. Jones gives himself a cheat meal of chicken once a week for the protein boost, and Casey still eats fish. Linebacker Brian Orakpo isn’t ready for a lifestyle change, but he was a fan of the lunch Charity Morgan left for him after a recent practice. A handful of Titans even gathered for a vegan Thanksgiving meal at the Morgans in November. Vegans or vegetarianism isn’t unheard of in the NFL. Detroit running back Ameer Abdullah switched last summer to help prolong his career — a move made easier with both his parents being vegetarian. 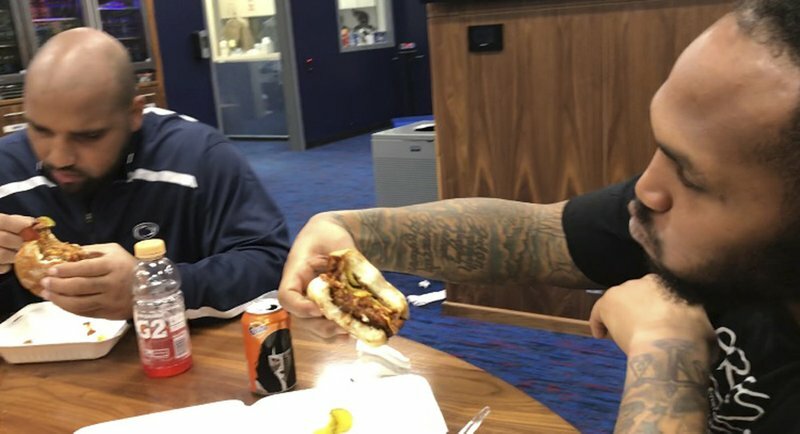 Washington left tackle Trent Williams stuck to a vegan diet through training camp this year after studying the links between diet and disease. The 6-foot-5, 320-pound lineman had to stop when he dropped to around 300 pounds, somewhere he hadn’t been since his freshman year of high school. He loved how much better he slept, but he had to gain that weight back to help his center of gravity. “The only bad thing was I couldn’t maintain my weight,” Williams said. The biggest issue for Tennessee is taste. Casey is still on the fence there, and grateful to have Charity Morgan jazzing up his meat substitutes. “Once you get all the sauce and the seasoning off of it, the texture of the meat or the substance that’s supposed to replace it, the flavor of that is horrible,” Casey said. For now, though, it’s tackles over tastebuds in Tennessee. AP Pro Football Writer Howard Fendrich and AP Sports Writer Larry Lage contributed to this report.